This Saturday (November 7th) is the Red for Recovery Mud Run at Staheli Family Farm. Have you ever watched the TV show American Ninja Warrior? Did you know that we have 4 local American Ninja Warriors?? I didn't! Brian Beckstrand, Jon Stewart, Rick Pitcher, and Dave Peterson (local American Ninja Warriors) will be participating in the mud run. The race starts at 9 am and there will be a a foam party and concert afterward that you won't want to miss. Check out the full schedule of events below. Get registered today! Tickets will go fast. You can register the day of but only if there are still tickets available. 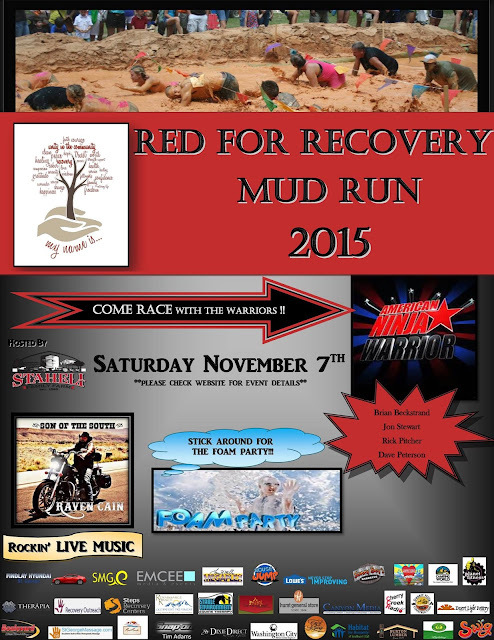 This race will benefit those in recovery from addictions.